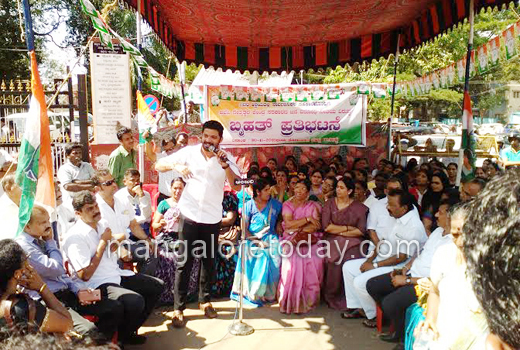 Mangaluru, Dec 01, 2015: DK - Dakshina Kannada district unit of the Mahila Congress held a demonstration on Nov 30, protesting against the policies of the National Democratic Alliance government at the Centre. Karnataka Mahila Congress president Laxmi Hebbalkar said that the demonstration was not a publicity stunt, but was aimed at creating awareness about the “misdeeds” of the Union government. Hebbalkar said that the Union government had not done anything to contain the rising prices of essential commodities, thereby causing sufferings to the common man. The portfolio of Minister for External Affairs should have been held by Prime Minister Narendra Modi instead of Sushma Swaraj, she quipped referring to the former’s frequent foreign trips. She said that instead of bringing in visible change in the life of the common man, PM Modi was diverting the attention of the masses by launching popular rhetoric such as selfie with daughter; Swachh Bharat; Mann Ki Baat; Beti Bachao, Beti Padhao and so on and on. On the other hand, the Congress believed in true democratic values and non-violence. She also alleged that the Centre is following step motherly attitude towards the State government. Black money : Minister for Health and Family Welfare U.T. 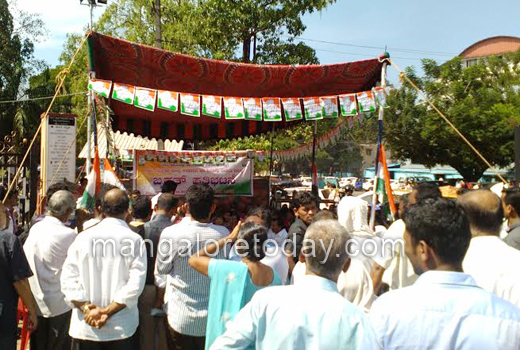 Khader said the NDA government came to power by fooling the people. PM Modi had promised to bring back the black money stashed abroad. “Forget bringing back black money; people now want the Prime Minister back in the country,” he said. MLC Ivan D’Souza said that the BJP had promised to bring back black money stashed in foreign banks within 100 days of coming to power. "The promise, however, has remained only on paper. The Jan Dhan Yojana of the Union government is a failure. Under Swaccha Bharath Mission, the government has spent Rs 150 crore for publicity. However, the impact of the mission is not seen in the country," complained the legislator. "When Karnataka government sought Rs 3,500 crore to tackle drought situation, the Union government released a meagre amount to the State. The prices of essential commodities had gone up in the last few months since the BJP had assumed office," he added. Shakuntala Shetty, MLA; Mamatha Gatti, district Mahila Congress president; and Kodijal Ibrahim, district Congress in-charge president, were present.